Deluxe plus, all-inclusive, oceanside resort located 10 minutes south of Cancun's airport. This is Palace Resort's largest and most secluded self-contained resort, situated on 123 acres, much of it retaining its natural jungle foliage. 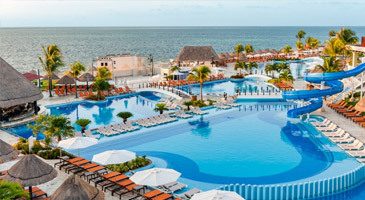 The hotel is recognized as a prestigious AAA Four-Diamond hotel and features two of the largest lagoon-style pools in Mexico and a Jack Nicklaus Signature golf course. The Resort also has a full 2314 rooms with either resort, garden, golf course or ocean view.